Sudan - Khartoum - Lord Ahmed meets Sudan President Omar Hassan Ahmad al-Bashir in royal palace. 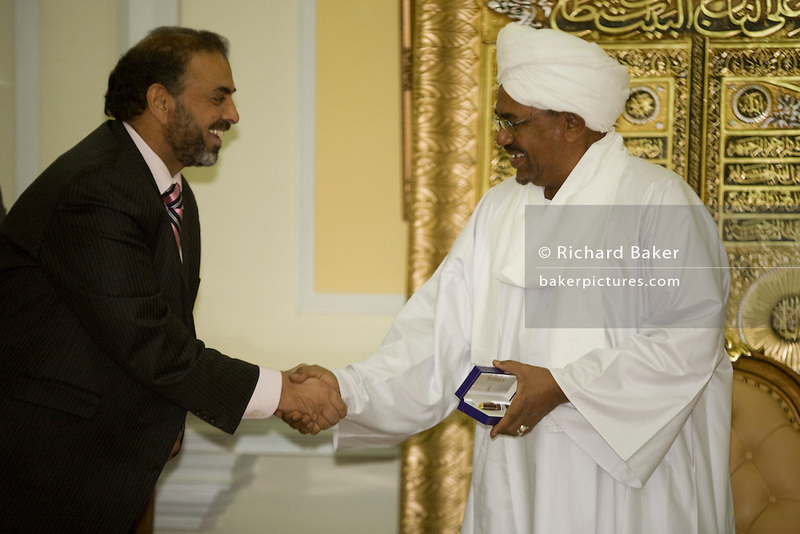 British Labour peer, Lord Ahmed of Rotherham is thanked by Sudanese President, Omar Hassan Ahmad al-Bashir after receiving a gift of a pen and mints for the head of state's two wives, in a reception room of his palace in central Khartoum. Al Bashir is head of the National Congress Party and has been in power since October 1993. Nazir, Baron Ahmed (born 1958) is a member of the House of Lords, having become the United Kingdom's first Muslim life peer in 1998 and is in this war-torn province of Sudan to attend the first-ever international Conference on Womens' Challenge in Darfur, hosted by the govenor in his own compound.